And now I shall continue my exposé on Value Stream Mapping. The secrets held within the VSM are slowly being revealed for all to see in this third in my series of posts. Some of the greatest science fiction masterpieces are series, such as Battlestar Galactica or The Wheel of Time, so perhaps some day value stream mapping will make it up there. Today I bring you the "Why" of Value Stream Mapping. 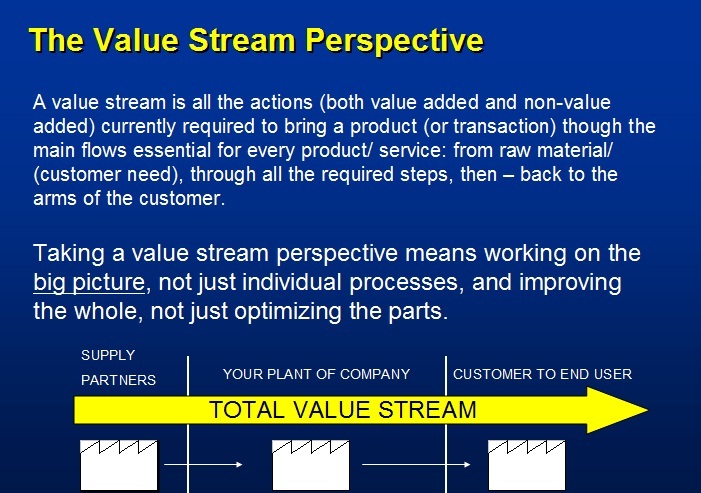 This value stream mapping presentation provides a brief history of value stream mapping, a comparison to simple process mapping and an excellent description of the process. It's a comprehensive presentation, perfect for a group training session. Apart from the nuts and bolts of value stream mapping, however, this presentation delivers the reason for using the tool. Many times we get caught up in the mechanics of our lean tools. We expect some kind of improvement just by doing value stream mapping. But value stream mapping is a higher level tool. The improvements that we derive from VSM are system level goals, that generally require a lot of work and perhaps significant capital investment. You can't just do a value stream map and expect to be 50 percent improved the next day. Sure, you can get some quick gains during a value stream mapping session. Just like any kind of analysis of a process, you'll readily see all kinds of small things that could be improved in each process. But since value stream mapping approaches the whole value stream, the focus is on improving the whole, not just the parts. Value stream mapping provides a blueprint for further continuous improvement activities. The presentation describes the future state value stream map as a "Vision". And that's the Why! The goal is to provide some direction for your company. Where shall we start? Let's do a Value Stream Map and figure it out. The presentation also includes an addendum that describes all of the symbols used in a value stream map. If you ever want to do your value stream map in Powerpoint, then these symbols are handy to copy and put into your own presentation. 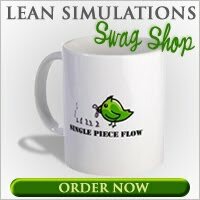 You can find the Powerpoint file at freeleansite.com, a great resource for more free lean stuff! Look for the file aptly named "Value Steam Mapping (VSM) in the left column. I've added this to my list of free lean tools and downloads. Mixed-model value stream is definitely one way to address low volume high complexity applications. But you're right. It's complicated and your team must be mature in lean to make it work effectively. Nonetheless, VSM is a good tool to demonstrate the lean concept. Seeing wastes help creates more awareness to both office/shop floor staffs. True. VSM is helpful when looking for waste in any process. But it's most effective when looking at the whole picture.